Join the discussion on our forums! Come discuss Coppertail Imposter over in our dedicated Coppertail Imposter discussion topic. It was fitting in fine until it gathered nuts and bolts. If your Coppertail Imposter is still on the board, you play Bronze Gatekeeper plus double Divine Spirit + Topsy Turvy for 36 damage on turn 8. That will never work. It only has Stealth for one turn. Why not just do that with any other big health minion? 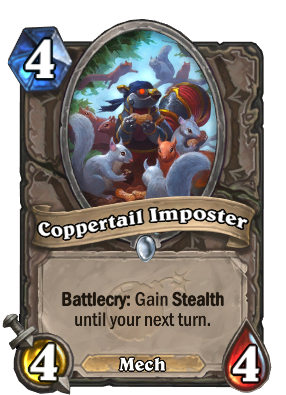 Coppertail Imposter seems very good as the base for Kangor's Endless Army - you would use non-mech minions and secrets to protect you in the first few turns, then drop Coppertail and curve into Wargear or Zilliax. The result is a big, powerful mech that you'll be happy to resurrect later in the game, and that you might be able to keep buffing in the meantime. Well, hindsight is 20/20 I guess. Prior to the expansion launch, it seemed like an interesting route for Paladin. A safer way for you to throw down Shudderwock into Grumble, Worldshaker next turn without risks. You'll also have 2-6 copies that may or may not be stealthed too, so it's hard to punish that! Dear god. I see the future of wild. It's like the old Galvadon dream of 3X +3 attack, windfury and stealth, but you don't have to be running a deck of mediocre buff cards to do it, and you can reliably get the full amount of damage, as well as a board full of deadly minions. I'm no great deckbuilder, but I gave it my best stab. Good stats, can't be targeted and prime opportunity to magnetize a ot of stats to it and then bash your opponents. Really good. Why's everyone talking about being a stealth mech for magnetic synergies and shudderwock, if it is basically Valeera the Hollow's battlecry? It gives your hero stealth, doesnt it? The wording on those two is the same. Edit: I see now, Valeera is a hero card, that's why it gives stealth to itself, being a hero. Ye, I was wrong. Yea, it's pretty much that. 1 safe target. Nuts with Zilliax on the next turn. Sleeper's OP, easy magnetic OTK. or close to it. Sometimes you whiff on Shudderwock, so it won't hurt. I don't think it's worth the slot in the deck. If you already mess up your combo, having a condition to help you get it back usually isn't going to work because you'll most likely be dead by that point.